Salvation And Survival: What Do You Think -- Concealed Carry On College Campuses? 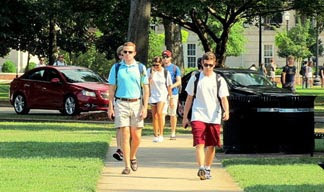 What Do You Think -- Concealed Carry On College Campuses? With yet another incident of violence with a gun -- this time in Colorado at a Planned Parenthood facility -- the topic of concealed carry on college campuses came up around our Thanksgiving dinner table. Our niece, who attends a state university here in Texas, is now allowed to carry concealed in classrooms, and is interested in getting her concealed license. But she still needs training before we feel she would be competent enough to exercise that right. My cousin's son, who is going to college here in Texas as an out-of-state student on a football scholarship is being trained in how to properly and safely handle firearms by my husband, but has to navigate not only his school's rules on concealed carry, but determine if a Texas ID would be enough to qualify for the concealed license. I imagine that there were many conversations like this across the country this holiday, as other states such as Colorado, Idaho, Kansas, Mississippi, Oregon, Utah and Wisconsin are among the growing number of states that widely permit concealed carry weapons on their campuses. According to the National Conference of State Legislatures, there are another 23 states who allow colleges and universities to decide for themselves whether to allow guns on campus. For me, it is a no-brainer --- with stipulations. I strongly disagree with the current line of reasoning employed on most college campuses (and public schools, in general). They have policies that call for a school lockdown; for students to remain in place, behind closed doors and away from windows, and to wait for someone to come rescue them. So, how did that work for those students at Virginia Tech, Sandy Hook Elementary, or Umpqua Community College in Oregon? The truth of the matter is this, those are the worst of the tragic school shootings in our history, but they are by no means the only instances. The earliest known United States shooting to happen on school property was the Pontiac's Rebellion school massacre on July 26, 1764, where three men entered the schoolhouse near present-day Greencastle, Pennsylvania, shot and killed schoolmaster Enoch Brown, and killed ten children (reports vary). Only one child survived. And you can go to Wikipedia and get a list of school shootings dating back to 1840. My point is this: Any shooting at a school is tragic, but when you consider sending a young adult, whom you love, off to college in today's social climate, it is imperative that you give them the best chance of survival should, God forbid, a shooting occur on their campus. I'm sorry, but telling them to close the door to their classroom, hide behind a desk, and wait to be rescued is making them sitting ducks. But, I also strongly believe that professional training should be a required condition for receiving a concealed carry permit on campus. A firearm in the hands of an inexperienced student is not what I would want, should an active shooter situation arise on campus. But all I have to do is remember the 2004 Beslan school siege in Russia to know that firearms in the hands of trained students would be an effective deterrent to such a tragedy. In case, you've forgotten that devastating event, a group of armed Islamic terrorists stormed a school and captured over 1,100 people as hostages (including 777 children). The three-day siege ended with the death of at least 385 people. I have read numerous accounts of that horrendous ordeal and what took place through those three days of hell. And I will also tell you that I have heard that this scenario is among the worst fears of our special operations military personnel. But what if some of those teachers in Russia had been properly trained to protect and defend those students? Think there might have been a different outcome? And do you really think that this scenario could never happen here on our native soil? Wouldn't you want your child to have the ability to defend him or herself and stop such a tragedy from happening? I know this is a highly emotional and controversial subject. But I also think students are more aware than ever that they are vulnerable and potential targets. For those unfamiliar with the responsible handling of firearms, fear of the unknown is often a concern. If students are allowed to carry, and a threat takes place, will you know the good guys versus the bad guys? And I've heard the argument, "We should just install metal detectors or establish 'safe zones' for those who don't want to participate and where firearms would not be allowed." So, where's the first place you would head if you were an active shooter? Obviously, everyone needs to come to terms with how they feel about this subject. And you need to know the laws and restrictions of your state and college campus... because they do vary. But I strongly believe that it is a discussion we need to have, both across our nation, and in our homes. The most precious commodity we have is our children, and in the days in which we live, it is apparent that we need to give them every opportunity to thrive and survive. I, for one, want to equip my loved ones with the ability and training (and lots of prayer) to become all that God intends for them to be. Luke 11:21 "When a strong man, fully armed, guards his own palace, his goods are safe;"